A large part of my job as a first-person historical interpreter is to give voice to those who can no longer speak for themselves. I try to never lose sight of the awesome responsibility that has been entrusted to me. I represent my character, but I also have the opportunity, through that character, to represent all the women and men who have passed through Barkerville over the years. Then there are the questions that we both love and dread, depending on how they are asked. I blame Hollywood for the unfortunate and sadly prevalent notion that there were only two kinds of women in any given gold rush. The first was someone’s diligent wife; she shows up occasionally. The second was the prostitute; according to the movies she made up about 99% of the female population, and she had a heart of gold. The character I play in Barkerville, Miss Florence Wilson, came from an upper-middle-class background in England. She was a published author, and had travelled to Russia before making her way to Vancouver Island aboard the first so-called “bride-ship,” the Tynemouth. Once she arrived in Barkerville Florence became the first librarian in British Columbia’s colonial history, a driving force behind the creation of the Theatre Royal, an investor in at least two mining properties, and a well-regarded saloon keeper. I consider it an honour to interpret Miss Wilson’s life. She was an entrepreneur at a time when that was nearly unheard for women in western society. She made a significant mark on the historical record of the Cariboo Gold Rush, when most women were not even mentioned by name in the archives and newspapers. When I play Florence I wear modest dress and speak with an upper class British dialect, and yet, nearly every day in Barkerville I am asked if I am a prostitute or a brothel keeper. This happens even after I have explained Miss Wilson’s important contributions to the development of the Province. It is, honestly, the most tedious and disheartening of inquiries. There are two reasons these questions irk me so much. First of all, it is indicative of the sad (and not in the least bit humourous) stereotype that most women in history were hookers. Just like in modern times, the vast majority of history’s females were not. Secondly, it turns the true life stories of history’s prostitutes into a joke, and they were anything but. Of course there were prostitutes and brothel keepers in the Cariboo Gold Rush. Their stories are as varied and fascinating as every other character. Many had fallen into a brutal life through unspeakable misfortune. Some were undoubtedly entrepreneurial, recognizing a business in which they might prosper. But many were relegated to a life they had never wanted or imagined. A life they often did not survive. I can only speculate on the reasons why some women of the gold rush wound up in this line of work. My personal guess is that most women who entered that life did so as a last resort. Regardless of how the prostitutes of our gold rush chose their vocation, their stories deserve to be considered and respected. We must refuse to allow these women’s lives to be reduced to lascivious punchlines. Last week I met a historian from Kamloops. At the end of my town tour she approached and asked me about the hurdy gurdy dancing girls, and if some of them might have also been prostitutes. I answered according to my research, and was very honest about the fact that my answer would be, in large part, speculative. She told me some fascinating stories she’d uncovered about gold rush-era prostitutes in Kamloops. We had a great, in-depth conversation, and I thoroughly enjoyed talking with someone who asked about prostitution from a historical perspective, with concern and care. I have no desire to diminish, sneer at, or mock anyone’s life story. Every story we tell in Barkerville involves real human beings who lived real lives. If you ever want to engage an interpreter in a thoughtful conversation about prostitution, please do… but try to be the kind of visitor who understands that history is an ongoing conversation, and that every person who lived before us deserves to have their humanity noted and appreciated. In doing so, you give attention and purpose to someone who mattered – someone who is part of the story of us. 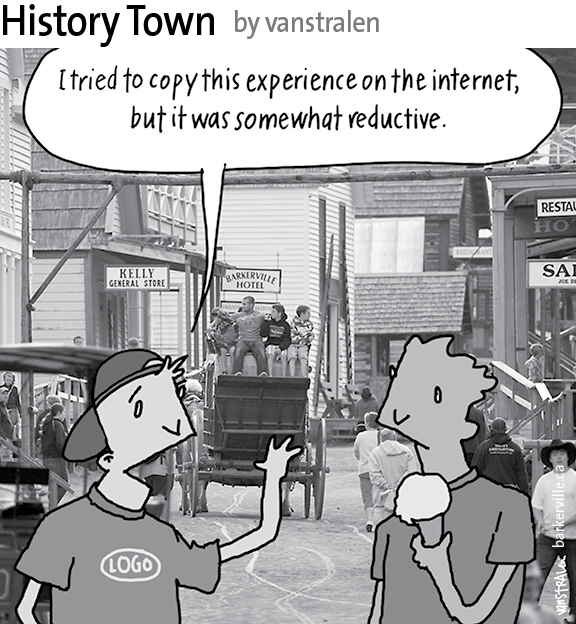 The above one-panel cartoon (originally published July 25, 2015) by Dirk Van Stralen, with accompanying editorial by Danette Boucher, is the eighth of twenty weekly entries that were logged – and subsequently blogged – as part of a 2015 collaboration between Barkerville, British Columbia and the Prince George Citizen aimed at introducing some of the quirkier advantages to living, working, and playing in the Cariboo Goldfields. We hope you enjoy!